I woke up today feeling like I needed a dose of poker, not another day of my usual work. So I drove out to Harrah's Cherokee and played for about four hours, taking home several $100 bills that had not been mine when I arrived. In one hand, it really paid off to have been keeping track of my opponents' patterns. One older gentleman across the table from me just adored under-representing his big hands, then letting another player do the betting for him. I lost about $50 to him in a very early hand because of that. But once I adjusted to what he was doing--i.e., the fact that if he stayed in a pot he usually had a significantly stronger hand than he was letting on--it was pretty easy to handle him. And about two hours into the session, it led to an opportunity to double my money. I had Q-9 of diamonds on the button. Several limped in ahead of me (it was a chronically passive limpfest), so I raised to $8. (All dollar amounts in this post are approximate; I did not take notes.) Mr. Passive was my only caller. The flop was Qh-8c-3h. He checked. I bet $11 into the $21 pot. He called. The turn was another queen. Excellent. He checked again. I bet $22. He called. This mostly ruled out the possibility that he was on a flush draw. He might pay to see one card, but he was too tight to pay to see the river if he had nothing but a draw--even a good one. There were no hands that would have flopped two pair that he would have played from early position, especially after my raise. So I could pretty much narrow his holdings down to an overpair (A-A or K-K, and yes, he would play them in this odd way) or a queen. If he had a queen, he had me beat, because I was confident he would not have called my pre-flop raise with anything less than a jack kicker, and probably not less than a king kicker. This meant that I would have a potentially tricky decision on the river: Do I assume he has an overpair and will pay off my trips a third time, or do I assume he has a queen with a better kicker, and hope to just check it down? Just as I was wrestling with this problem, the PokerPro table flashed the nine of hearts for our final board card, giving me the nuts. It was perfect. He probably wouldn't put me on a flush draw, and if I had been wrong about his drawing propensity, he had just gotten to the hand he wanted, not knowing it was now a loser. If he had an overpair, it probably didn't change anything. But if he had been slow-playing a bigger queen, he was sunk. He checked again. The pot was now about $85. I had about $160 left, and Mr. Passive had me covered by just a few bucks. How much would he pay off? Well, another factor came into play. I had twice gotten lucky after playing speculative hands aggressively, with the hands shown. Once I raised a short-stacked opponent all-in on the flop with just a baby flush draw and got there, besting her top/top. Another time I did it with my suited connectors having only flopped second pair, and the other guy called me with top pair, only to see me hit trips on the turn. So I knew that Mr. Passive might be looking to catch me trying to blow him off of a decent hand with an all-in bluff. That was the deciding factor: I was going to go for the gold and hope that he read me as being out of line again. I can no longer remember who it was, but a blogger I used to read, who played mostly online, loved the phrase, "Overbet for value," and that was screaming inside my head. It's pretty rare that I'll shove double the size of the pot on the river, but this seemed like a damned good time to make an exception. I tapped the "all in" and "confirm" buttons, and less than two seconds later he had registered his call. 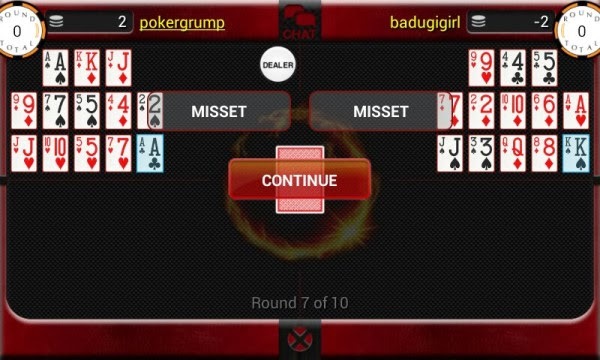 He had A-Q, and had been well ahead until my lucky three-outer on the river. Maybe the surgeon general should issue a stern proclamation to be posted in poker rooms around the country: "WARNING: SLOW-PLAYING MAY BE HAZARDOUS TO YOUR HEALTH." At first glance, this appears to be two pretty ordinary fouled hands in a game of open-face Chinese poker. But look again. There's something peculiar about the hand on the right. Go ahead--take a closer look. I'll wait. Do you see it? She got 13 cards with no pair--a 13-card straight! If you dealt out 13 cards from a well-shuffled deck, what is the probability that you'd get that result? I don't know, but let's figure it out. The first card can obviously be anything. To state the trivially obvious, the probability of getting a non-pairing first card is 1.00, or 100%. The second card can be anything except a pair to the first. So with 51 cards left in the deck, 3 kill our hopes for the Big Straight, and 48 keep it going. The probability of a card that doesn't pair the first one, then, is 48/51, or 0.941, or 94.1%. The third card must not pair either of the first two. There are 50 cards left in the deck, of which 6 will create a pair and 44 will not. So the probability of getting a non-pairing card is 44/50, or 0.880, or 88.0%. We continue this pattern. When we're ready to deal the 13th card, there are 40 cards left in the deck, of which just 4 will complete our lovely 13-card straight, while 36 will pair one of the first 12 cards now on the board. The probability of hitting one of our "outs" is therefore 4/40, or 0.100, or 10.0%. Because every one of the 13 events we've described must occur in order to end up with the 13-card-no-pair hand, we multiply all of the individual probabilities together: 1.00 x 0.941 x 0.880 ... x 0.100. The final product, if I didn't screw up the calculation, is 0.000106, or 0.0106%. To put it in the conceptually easiest terms, this will occur about 1 in 9460 hands. If I've ever seen this happen before in an OFC game, I didn't notice it. You may be tempted to think that knowing 13 other cards along the way (i.e., the ones dealt to me in the picture above) changes this probability, but it doesn't. It would change our ongoing estimate, card by card, as to whether this hand will play out as a 13-card straight. But the question I've really asked is how often the deck will have been arranged by a random shuffle so the 13 cards destined to go to player X will contain no pairs. When asked that way, it makes no difference what happens to the other 39 cards, whether they are seen or unseen. The answer does change if instead we ask the probability of a shuffled deck yielding a 13-card straight to somebody when two (or three, or four) players are dealt in, but it makes my head hurt to think about how to calculate that, so I'll leave it to somebody else.